On May 22, 2018, theZhong group at Institut Pasteur of Shanghai, Chinese Academy of Sciences published online an article entitled "Hepatitis C virus NS4B induces the degradation of TRIF to inhibit TLR3-mediated interferon signaling pathway"in PLOS Pathogens. Hepatitis C virus (HCV) is one of the main causes of chronic liver disease. HCV can evade the surveillance of innate immunity to establish persistent infection, leading to liver cirrhosis and hepatocellular carcinoma. HCV can be sensed by RLR (RIG-I like receptor) and TLR3 (Toll-like receptor 3) to activate the interferon response. The molecular mechanisms for how HCV evades the RLR-mediated interferon signaling have been extensively studied. MAVS/VISA, acritical adaptor proteinin the RLR signaling is cleaved by HCV NS3/4A serine protease, and STING, another adaptor protein in the signalingis targeted by viral protein NS4B.Both of these actions result in the inhibition of the RLR signaling. On the contrary, much less has been done for HCV evasion of the TLR3-mediated interferon signaling, which recognizes viral double-stranded RNA and activate downstream interferonexpression via the adaptor protein TRIF.Therefore, it remains imperative to investigate whether and how HCV regulatesthe TLR3 signaling pathway. 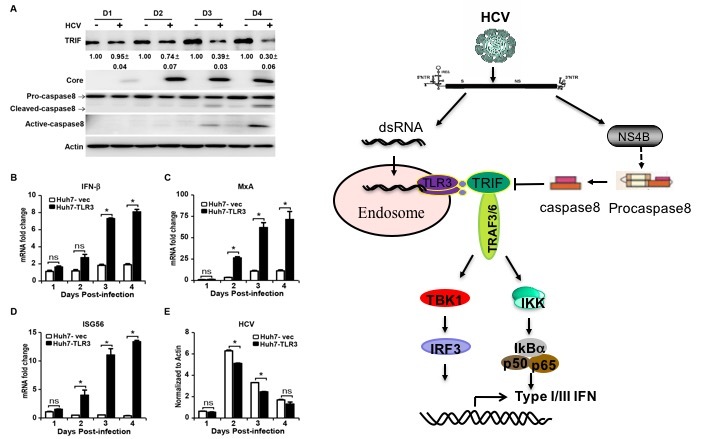 In this study, researchers reported that HCV infection can activate TLR3-mediated interferon signaling pathway in hepatocytes, but HCV-encoded NS4B can inhibit this signaling pathway by promoting the degradation of TRIF. Mechanistic studies demonstrated that casapse8 plays a critical role in the NS4B-inducedTRIF degradation. Either HCV infection or NS4B transfection activates caspase8 to promote the TRIF degradation.Knockout of caspase8 can prevent the NS4B-induced TRIF degradation, and thus enhance the TLR3-mediated interferon signaling activation in response to HCV infection.In conclusion, this work reveals a new mechanism for HCV to evade innate immune response and provides a new clue to decipher persistent HCV infection. This work was directed by Prof. Jin Zhong, and mainly conducted by Yisha Liang, a Ph.D student in a joint graduate program by Institut Pasteur of Shanghai and ShanghaiTech University together with Dr.Xuezhi Cao. This research was supported by National Natural Science Foundation of China and Chinese National 973 Research Program. Left: HCV infection activates caspase8 and reduces TRIF protein level in Huh7-TLR3 cells.